Accuweigh recently installed a bulk bag weigher at SE Hauliers based in Hemmant, Queensland to fill bulk bags with fertilisers and various products. Accuweigh’s Brisbane South branch supplied the bulk bag weigher to SE Hauliers. 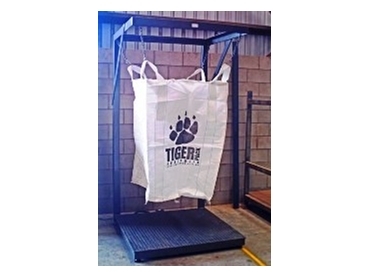 The Australian-made bulk bag weighers are made from locally produced BHP steel and based on a QWM platform scale design of heavy duty construction, fitted with a steel structure for holding the bulk bags. The bulk bag weigher has a weighing capacity of 3,000kg and carries full trade approvals. The fertiliser is fed by an overhead feeder into a bulk bag fitted to the steel framework rigidly attached to the bulk bag weigher. The connected R320 digital weight indicator is used for manual filling but can be fitted with relay outputs to control the feeder for full automatic operation of the bulk bag weigher. Accuweigh is a major Australian industrial weighing equipment company operating eight branches across all mainland states to provide Australia-wide sales and service support for bulk bag weighers, platform scales as well as diverse industrial weighing and filling equipment.